My MacBook (wouldn’t want it to melt with my masterpieces living inside). My cell phone (to call 911 and so kids can watch Netflix at shelter/hotel). Our coats (it’s friggin cold out). My wallet (for access to credit cards and driver’s license). Wouldn’t that just make sense? I hope my light switch did not cause this fire. And speaking of fires, after I brilliantly installed the light switch, I almost DID set the house on fire. I dropped a waffle through the grate of the toaster oven onto the heating element. The waffle caught and started to FLAME, people! Orange flames, like bursting and crackling! In the house! Scared me to death. The kids played in another room, completely oblivious. The dog came to my immediate assistance to growl at the fire and try to trip me. I blew on the waffle, like I was trying to put out birthday candles. Probably not the best idea to give an oxygen supply to a flaming breakfast treat, but sadly, this was instinctual. At least I didn’t throw water on it? In seconds, the flames were out and I’d successfully fought my first fire. I blame the entire incident on a design flaw in the toaster oven. The heating element is unprotected and exposed (my toaster oven at work has a metal grate that covers the element, this one does not). I’m wondering if I should email Cuisinart? 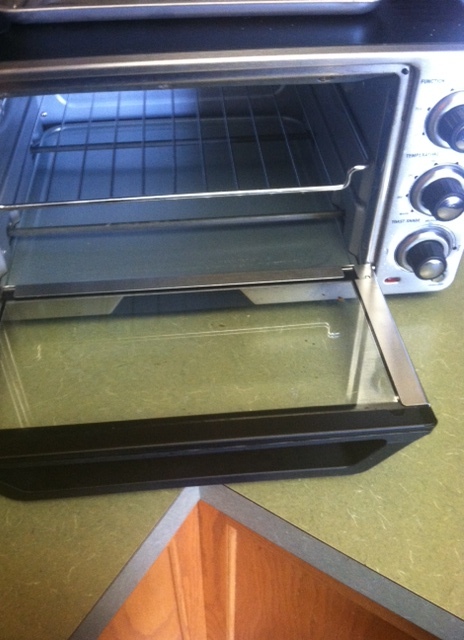 The Toaster Oven involved in the Incident. Notice the unprotected heating elements. 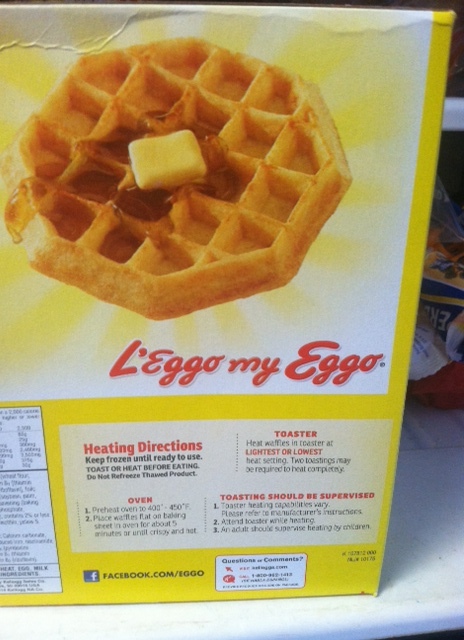 The Delicious Waffles involved in the Incident. 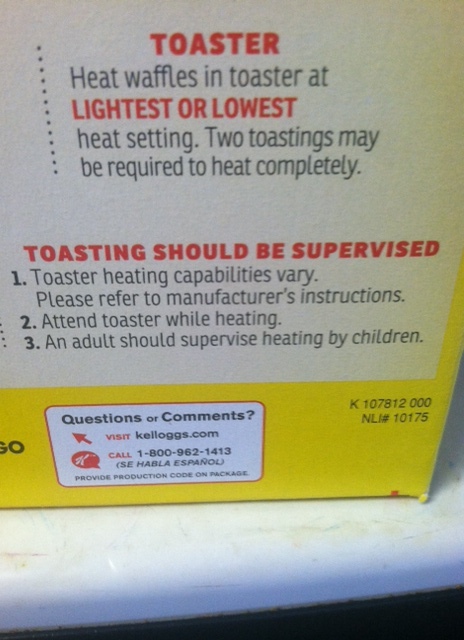 Close-up of Directions: “Toasting Should be Supervised”- I’m a living testament to that directive. You never know when a waffle will tumble to the bottom of the toaster oven (or accidentally be pushed through the grates by an impatient mother). Ah, the exciting life I lead! The adventure never ends. Have a happy, flame-free day.